Picks your fave tunes and gives info about your library. 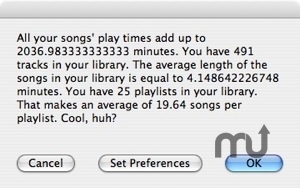 Is there a better alternative to ITunesAll? Is ITunesAll really the best app in MP3 category? Will ITunesAll work good on macOS 10.13.4? ITunesAll... In one click, you'll be listening to your 25 favorite songs while watching astonishing info about your music library! You can even decide to randomly listen to your whole library instead of your top 25! ITunesAll needs a review. Be the first to review this app and get the discussion started! ITunesAll needs a rating. Be the first to rate this app and get the discussion started!